Amar Gajjar studied medicine and completed his internship at Grant Medical College in Bombay, India. He completed an Immunology Research Fellowship at the University of Oklahoma following which he did his pediatric residency at All Children’s Hospital, University of South Florida. Dr Gajjar was Chief Pediatric Resident at USF (All Children’s Hospital) from 1988-1989. Dr. Gajjar completed his Pediatric Hematology/Oncology Fellowship at St. Jude (1989-1992) and went on to complete an additional year of Fellowship in Pediatric Neuro-Oncology. Dr. Gajjar joined the Division of Neuro Oncology as a Faculty Member in 1993. Since joining the faculty Dr Gajjar has risen steadily through the academic ranks at St. Jude. He was appointed as Division Director of Neuro Oncology in 2002, promoted to Full Member (Professor) in 2004 and in 2005, he was appointed the Co-Leader of the Neurobiology and Brain Tumor Program. In recognition of his academic excellence in 2007, he was awarded the Scott and Tracie Hamilton Endowed Chair in Brain Tumor Research. In 2016, he was appointed as Chair, Department of Pediatric Medicine. Nationally Dr. Gajjar was appointed Chair of the Brain Tumor Committee in the Children’s Oncology Group (2009-17). 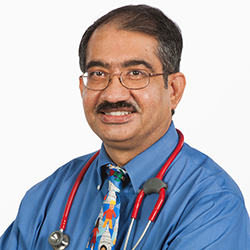 Currently, Dr. Gajjar is the Chair, Department of Pediatric Medicine at St Jude Children’s Research Hospital. He is the principal or co-principal investigator in several innovative clinical trials of new treatments for a variety of brain tumors, especially medulloblastoma. He has been instrumental for the growth in the Neuro Oncology Program at St Jude and developed an international collaborations with leading brain tumor programs in Germany, UK, Australia, Canada and the United States. He currently serves on the Editorial Board of Neuro Oncology and Up-to-Date and has been on the Editorial Board of the Journal of Clinical Oncology. He also serves as an Adhoc Reviewer for many scientific journals. Dr Gajjar contributed significantly to the literature and has published his work in several high impact journals. Dr Gajjar has mentored numerous fellows in neuro oncology who are scattered throughout the globe.